The Yellow Dog Project: What is it? What does a yellow ribbon on a leash mean? Here at BlueDog, we support the Yellow Dog Project. You may have seen their logo on the front page of our website. 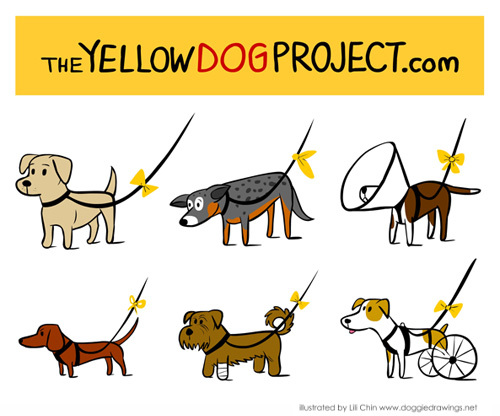 Do you know about the Yellow Dog Project and why it’s so great? If you see a dog with a yellow ribbon on his or her leash, it means to give them space. It may not be because they are aggressive, but instead they may be in pain, may be anxious, could be in training to be a service dog, or other reasons. 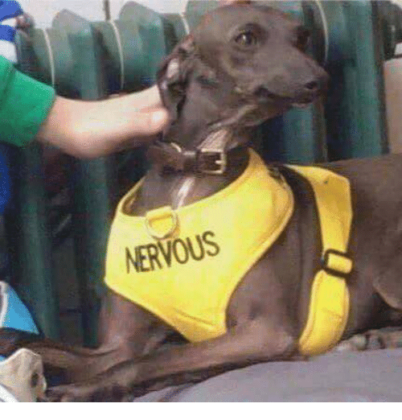 Some dogs require more space and shouldn’t be approached head on because of certain reasons, and making people aware of the need for space with a simple ribbon helps. That’s why the Yellow Dog Project aims to educate people on the meaning of the yellow ribbon and the reasons a dog should not be crowded. Some people take it a step further, but it’s not necessary for you to explain every issue with your dog to another person. Some owners prefer privacy, and a discrete ribbon is perfect for just that. It means “give me space!” and that’s all. The great thing about the Yellow Dog Project is identifying on your own that your dog can be reactive or otherwise when approached or crowded. This is a good step to beginning training and rehabilitation for your dog. It’s important to realize the yellow ribbon is not an excuse to avoid training your dog, and it’s not an admission or confession of guilt. If your dog needs a yellow ribbon, he or she is not the only dog to wear one. It’s OK for your dog to need a yellow ribbon! Many dogs, especially rescue dogs or inherited dogs, have had experiences we will never know about and may have special fears. Many people are still unaware of what the yellow ribbon may mean, so you cannot expect people to still not approach your dog. That’s why we aim to let as many people know about it so they’ll recognize it if they see it. A yellow ribbon is not a cop out, and you should still avoid bringing an uncomfortable dog to a place with a lot of people, dogs, or both. Have a yellow ribbon dog and need help with training? Contact us today!